The Stewardship Committee introduces a new series of articles entitled Stewardship is YOU, featuring insights and points of view from a wide range of Parishioners and guests from our community who bring Stewardship alive in various ways. The aim of Stewardship is YOU is to engender thought and dialogue on a host of issues about the many programs of our Parish and to remind us all that Stewardship is alive in everyone at St. Teresa. Jessica and Caleb Marx have been members of St. Teresa’s for many years. 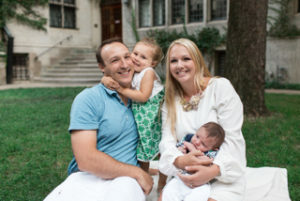 Despite the challenges of demanding careers and raising two young children, Jessica and Caleb remain active and engaged at St. Teresa. Caleb volunteers as a manager of the Food Pantry, and Jessica is the Parish Council president. They are true champions of our parish, and many fellow parishioners have found St. Teresa by way of introduction from Caleb and Jess. With this edition of Stewardship is YOU, we ask them about how they’ve approached the idea of evangelization in today’s world. While you may not think of it as evangelization, you’ve both been active in sharing your experiences in the church with others and inviting them to visit St. Teresa’s. How does that discussion with others begin for you? The social programs and special events at St Teresa’s have been great opportunities for us to invite our friends to participate in and personally experience the St. Teresa community. For us, these programs have included Food Pantry, Time of Your Life, the Worlds Smallest Block Party, the Baptism of our children, and Cuisine De Coeur. The conversation often turns to why we are members of the Parish and we always mention that although we live only two blocks from Old St. Pats, we travel to St. Teresa’s. Convenience wasn’t the largest part of our consideration when it came time to find the perfect parish community and, at St. Teresa’s, we feel we have just that. We feel lucky to be a part of this community. Are there things about our church that you emphasize or are sure to convey? St. Teresa’s is an active community with a diverse group of people who demonstrate a commitment to supporting each other and the city we love. We have made many friends here that have supported us in our faith & daily lives. Father Frank puts forth an enormous amount of passion in every homily, and breathes life into the St. Teresa community. We don’t just feel like a number here, we feel like we are part of a family. What have you learned through your experience in trying to describe St. Teresa to others and how has affected your own faith? 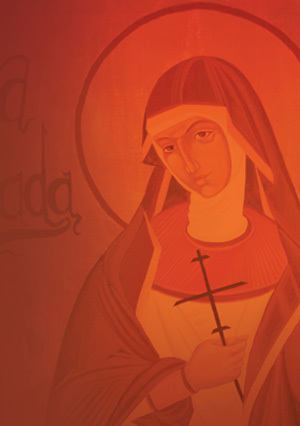 I’ve found that whenever we describe St. Teresa’s, we always do so with the passion & excitement we experience here. Every time we volunteer, attend social functions, or help one of the Ministries in supporting other parishioners or our wider community, it leads to a deeper and more enriching experience with our faith personally. That’s very motivating for us to share that with those we care about. What feedback have you received from some who have come to St. Teresa’s – what have they since shared with you about their experiences here? St. Teresa’s is a very special Church and people we’ve invited sense it as well. For a person who hasn’t been inside a Church in awhile, or relies on general media sources to frame their idea of what a Church is, St. Teresa’s is a refreshing and positive experience. Here is a small, unique, personal place where smart, vibrant people explore their faith and together make a positive impact throughout our community. Our involvement has always been rewarding and fun with those we know as well as those we get to know through these programs. As parishioners, we’re accountable for the well-being of St. Teresa. Through service to, rather than control of, those in our communities, we bring the spirit and ideal of our Church alive. Even though our own faith is a very personal experience, as every parishioner’s is to them, each is nurtured and grows under the umbrella of St. Teresa. It’s our responsibility to share the love of St. Teresa throughout our community, and ensure our children have an equally enriching place to discover and explore their own faith. Click here to volunteer with the Food Pantry. To discuss how you can use your own God-given talents at St. Teresa of Avila, contact Rebecca in the parish office at (773) 528-6650 or robrien@stteresaparish.org.